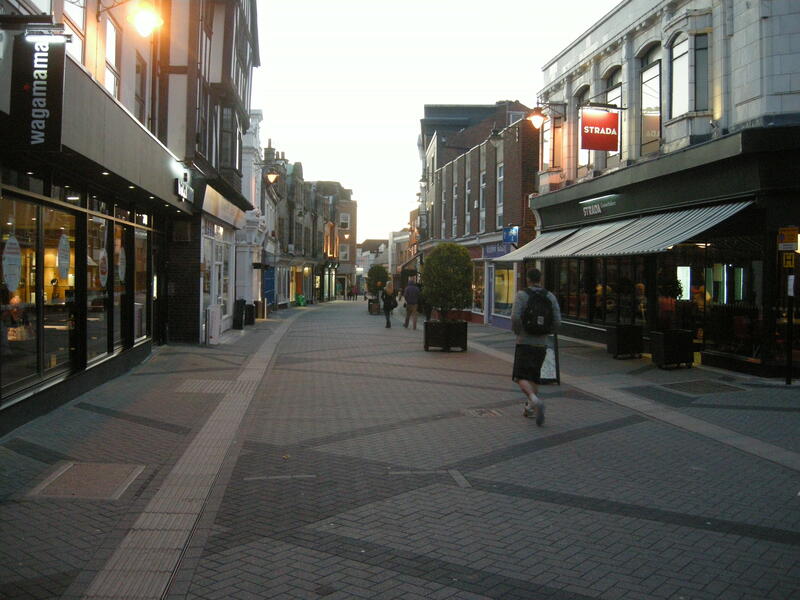 My local paper, the West Sussex County Times, have reported an apparent proposal to reintroduce motor traffic to a pedestrianised street in Horsham – West Street. Could traffic be brought back into pedestrianised West Street? Should traffic be reintroduced to West Street in Horsham town centre? That’s a question Horsham District Council will be asking of residents, despite the proposal being slammed by councillors this week. On Tuesday HDC’s Strategic Planning Advisory Group met to discuss the updated Horsham Town Plan, looking at what the town could look like in the future. The area covered by the draft plan has now been extended to include The Forum, West Street and Swan Walk, and traffic using Horsham’s main shopping street in the evening is one of the proposals put forward in the report. Produced by private consultancy Urban Practitioners, the Town Plan is designed to give the council a framework to refer to when considering planning applications and other proposals for Horsham. The council confirmed this week it will go out for a four-week public consultation on Friday May 4. This will include the proposal of reintroducing ‘two-way vehicular access’ to West Street to ‘introduce additional activity’ to the area. Liz Kitchen (Con, Rusper and Colgate) added: “I entirely endorse Roy Cornell’s comments. I remember even further back when we had two-way traffic in West Street.” She added that priority should be given to improving the walkway from West Street to Sainsbury’s and The Forum. 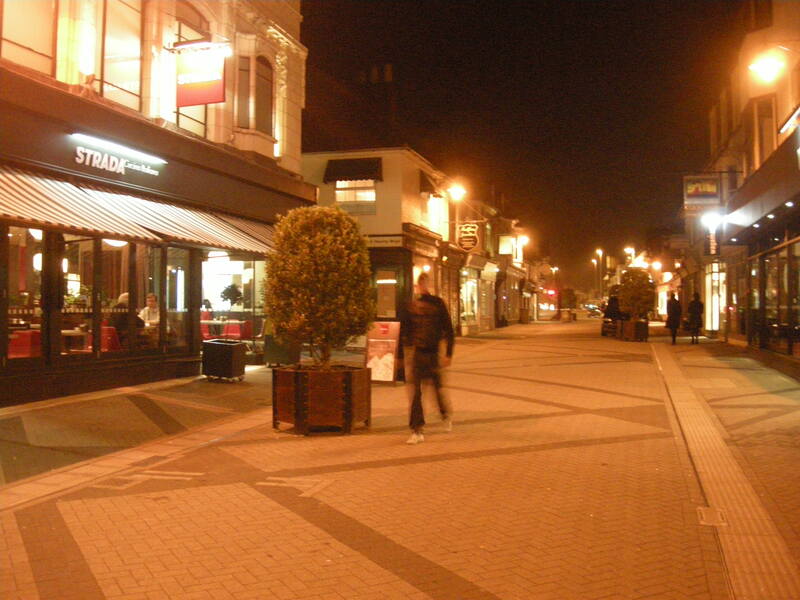 The street was initially pedestrianised more than thirty years ago during extensive town centre redevelopment. Alternative options suggested are to have one-way traffic or to add authorised street parking to West Street. Despite the opposition from members on Tuesday, a council press release issued the following morning announced the consultation will go ahead as planned. It called the plan for changes in West Street and other areas of the town ‘exciting opportunities’. 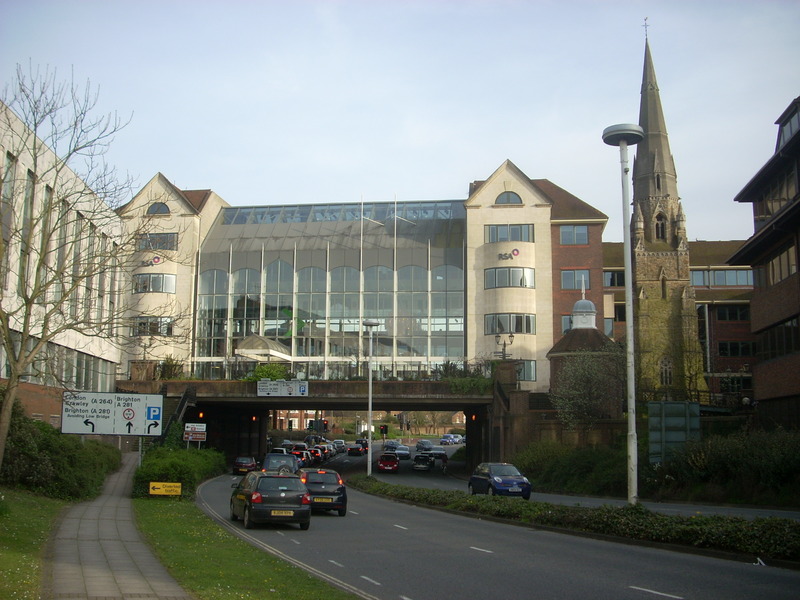 West Street was, originally, the main route for traffic through Horsham, for vehicles travelling from Guildford to Brighton, and vice versa – it formed part of the A281, the main road between the two. At the same time, it was (and still is) one of the main shopping streets in Horsham. The street could accommodate this dual function – as a place for shopping, and also as a through route – while the volume of motor traffic passing along it remained low. Unfortunately, from the 1950s onwards, the use of motor vehicles in Britain exploded, and West Street became rather clogged. The street was too narrow for the two-way movements of vehicles along it, given the increasing number of parked vehicles at the side. The first attempt at a solution was to make the street one-way. This is the situation we can see in the photograph below, taken from the County Times. No space here for two-way traffic, given the number of parked vehicles. At a later point, the direction of the one-way street was reversed (I have not been able to establish why). Finally, in the 1970s, an ‘inner relief’ road arrived in the shape of the dual carriageway Albion Way. The section shown below looks much like it would have done after construction. Like other “picture postcard” towns which have managed to retain their character despite the changes of time, [Horsham] now faces an acute need for more room for people to shop and move about the town centre, and room for their cars. The increasing numbers of cars moving through and into Horsham needed to be accommodated, in other words, without destroying the historic centre. Albion Way was built to solve this problem, to whisk cars through the town, and into its car parks, while ‘preserving the character’ of much of the centre. To some extent, this was a fairly enlightened move from the Council; the cars were now to be kept out of West Street, which runs parallel to Albion Way. Some civility for the town centre had been purchased, at the expense of an inner ring road. 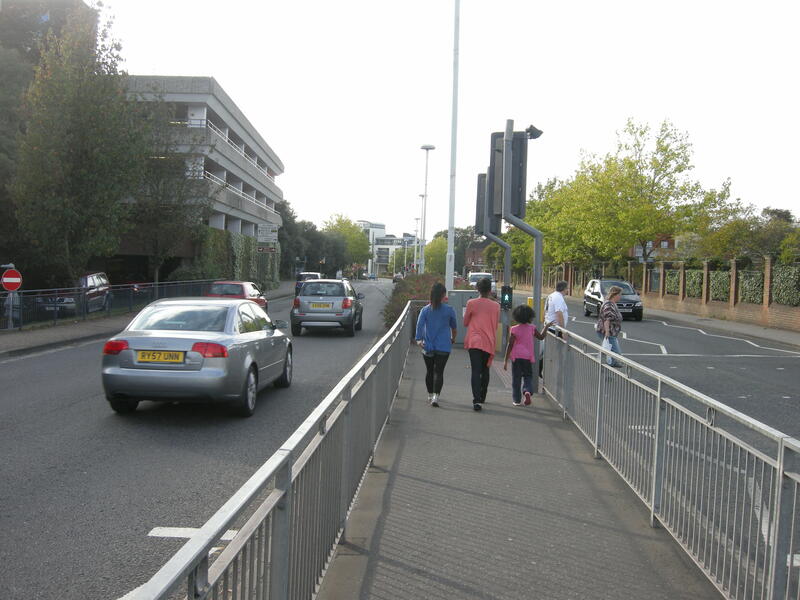 Of course, Albion Way now presented a serious barrier to pedestrian movement in and out of the town centre, but this wasn’t apparent to the planners at the time, who thought that two murky subways, and no surface crossings, would be sufficient. One of these subways was particularly hated, and was removed in subsequent redevelopment in the 1990s. But it doesn’t really seem fair to blame the planners of the 1970s for their lack of foresight; they underestimated how unpopular subways would prove. They also weren’t to know that, subsequent to the construction of Albion Way, Horsham would have a bypass constructed, which removed (or should have removed) much of the justification for the width and capacity of Albion Way. A dual carriageway running through the centre of Horsham shouldn’t really be necessary. But Albion Way is now one of the substantial problems that this new Horsham Town Plan is attempting to solve; in fact I would say it is the most pressing problem. The situation has not been helped by the extension of the original 1970s dual carriageway at both ends in the 1990s, when we really should have started to know better. At the southern end, a supermarket was constructed on school playing fields, and Albion Way was smashed through a parade of shops to reach it. At the northern end, an insurance company wanted to expand their offices, and did so by building across a new extension of Albion Way, which incidentally necessitated the destruction of a church. The Town Plan has some sound ideas for this road, about which I will have more to say later, but for now, I will turn to its proposals for West Street. The suggestion that motor traffic could be reintroduced to West Street has, I think, been met with an almost universally hostile reaction, including from town councillors. Residents don’t seem particularly keen on sharing their shopping space with motor vehicles; the reports in the newspaper come at precisely the same time that traffic is now being banned from the ‘shared space’ of East Street during shopping hours, a decision I have commented on here. At this point, I think it is important to consider what the Horsham Town Plan actually says. The town centre is extensively pedestrianised. Whilst at first glance this seems beneficial for pedestrians, it also limits on-street activity, and results in parts of the town which feel dead at night. It may be useful to consider ‘de-pedestrianising’ some streets. The recent redesign of East Street provides an indicator of how this could be done successfully, allowing traffic whilst still providing a high quality pedestrian environment. Part of West Street could be re-opened to traffic, maybe just in evenings, with on-street parking and loading. This would provide additional activity in the evening when West Street can become quiet and inaccessible in the absence of any evening functions. Any introduction of traffic into part of West Street would require careful consideration. There would need to be significant physical changes to accommodate vehicles together with the necessary traffic orders and traffic/parking enforcement. This advice, it has to be said, is rather more qualified than how it has been presented in the local press. Note the use of the words ‘careful consideration’, for a start. The Plan also talks of only re-opening a part of West Street to traffic, and only in the evening. As the Plan states, the intention of such a re-opening would be to address the lack of activity on West Street of an evening, which indeed makes it feel ‘dead at night’. This is definitely a problem. 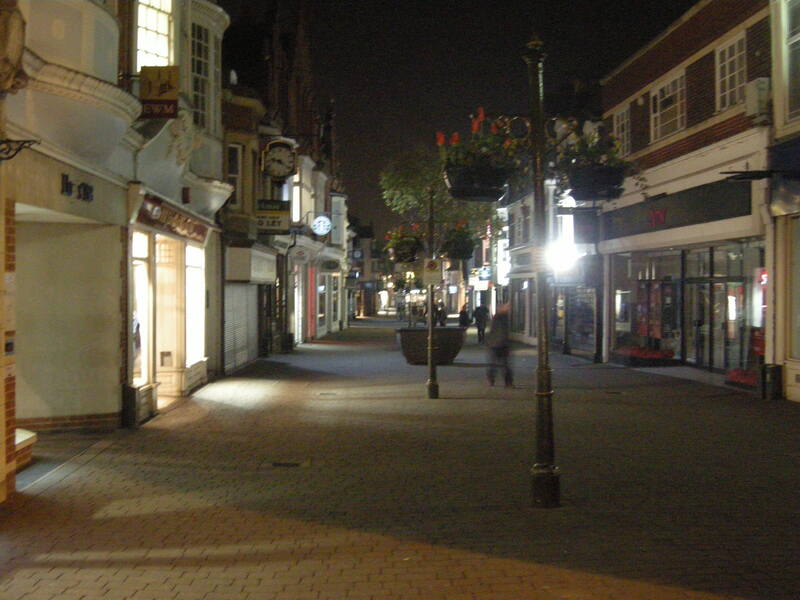 West Street is busy during the day – possibly the busiest street in Horsham – but at night, it becomes very quiet, and slightly intimidating. Female acquaintances of mine do not like to walk down it alone at night. East Street, by contrast, feels rather safe of an evening; there are, typically, many more people on it, and many more people watching it. One difference between the two streets is that East Street, of course, allows motor vehicles to progress down it, while West Street does not. If we were to take a superficial reading of the situation, therefore, we could suggest that East Street is lively because motor traffic passes down it, while West Street is not lively because motor traffic does not pass down it. Sadly, it is precisely this superficial reading which appears to lie behind the well-meaning suggestion to reintroduce traffic to West Street of an evening by the authors of the Town Plan, who, unfortunately, have failed to assess the real reasons why East Street is lively, and West Street is not. I do not dismiss the movement of motor vehicles out of hand – I think they can play some role in keeping a street lively, and observed. But they will do nothing to address the real problems of West Street, at night, the first of which, and the most serious, is a total absence of any activity on the street itself, from the hours of 5:30pm to 9:00am. Every single shop on the street is shut for this period, barring one coffee shop which stays open until 7:00pm, and one very small upstairs restaurant. People parking their cars on the street will introduce some activity to the street, it is true, but not enough to make it feel safer, and not enough to justify the disruption to the street itself caused by the reintroduction of motor traffic. By contrast, East Street has, by my count, some eight restaurants on it, that are open until late into the evening. The street is observed by the people eating in these restaurants, and by the people coming and going from them. There are also a handful of bars just around the corner, in Market Square, which also serve to keep the street observed and active. It therefore feels safe, unlike West Street, which is not observed by anything, and is instead a shuttered trench; an overground subway. One obvious solution immediately presents itself, and that is to encourage, into West Street, activity that will go on late into the evening – those restaurants, or bars, which are so prominent on East Street, and which are so absent on West Street. This should not be beyond the wit of the Council; to prioritise the applications of these kinds of businesses into any empty units on the street. Another problem is that West Street, of an evening, is a long, uninterrupted canyon, unobserved, and with only one side-street along its 300 metre length. You are effectively committed to walking all the way down it once you have embarked onto it, which can be a nerve-wracking experience. East Street is very different; it has multiple side entrances, which permit movement across and onto the street, rather than simply along it. This is another reason why it feels lively and active, and West Street feels rather dead. The pedestrianised West Street would perhaps also be a little more lively of an evening if more people were aware that cycling along it, out of shopping hours, is in fact legal. Unfortunately this legality remains unpublicised by the Council; to those not disposed to dig around on the Council’s website, cycling along West Street feels and appears illegal, with signage to suggest so, and consequently very few people do so. In any case, there are two important reasons for the difference in character between the East and West Street of an evening; the amount of restaurants and bars, or any premises open until late, and the amount of cross-cutting streets and entrances. These are both far more important than the simple absence of motor vehicles on one of them. So it’s a real pity that the Town Plan, while correctly identifying a problem – namely the quietness of some streets at night – has diagnosed the wrong cause, namely, a lack of motor traffic. The town centre is extensively pedestrianised. Whilst at first glance this seems beneficial for pedestrians, it also limits on-street activity, and results in parts of the town which feel dead at night. East Street is lively with or without cars of an evening; this is because of the essential character of the street, not because cars are permitted onto it. The Council, and the authors of the Plan, Urban Practitioners, would do well to heed this lesson. This entry was posted in Car dependence, Horsham, Horsham District Council, Parking, Pedestrianisation, Shared Space, Street closures, Town planning. Bookmark the permalink. Interesting. 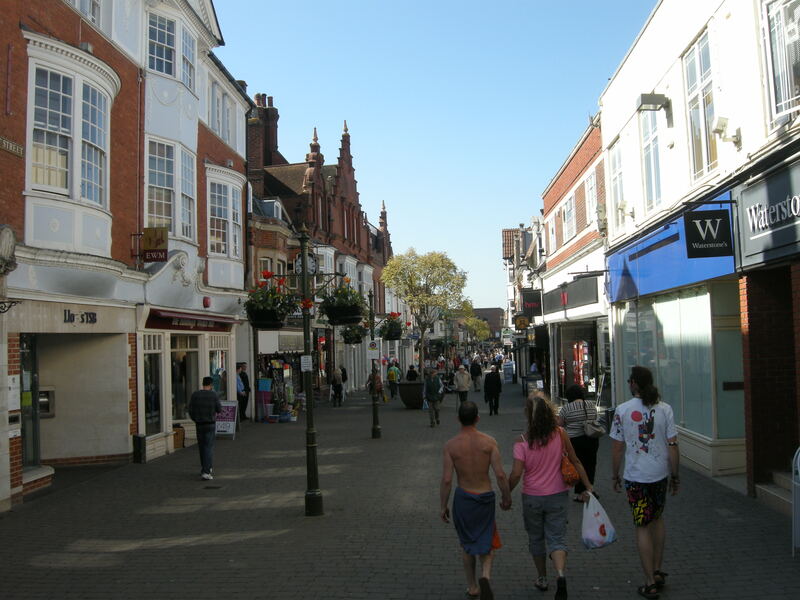 Godalming, Surrey, has a similar arrangement to what appears ot be proposed – the High Street is closed during the day with access-control for residents, deliveries and buses, but open (one way) at night. It is configured largely as a shared-space “open street” concept, and in fact the passage of cars down it in the evenings isn’t all that intrusive. For all that it isn’t really necessary, as the street has a good mix of small shops with restaurants and pubs. I remember when High Street was the main road through from Guildford towards Haslemere – the London-Portsmouth traffic had long since been bypassed – but a significant number of terraced homes was flattened and a community sliced in half to make “Flambard’s Way”, a mini-bypass of the High Street. In fairness, the overall impact was not entirely adverse thanks to the inprovements for the High Street. What intrugues me about your report though is this – if public opinion is believed to be hostile, and clearly many councillors from more than one party are opposed, why on earth are they persisting with a consultation? Has someone got to them? Do they fear litigation from some bloody-minded pro-car lobbyist if they don’t go through the motions? Paul M, most of our local councillors from the controlling party ARE the bloody-minded pro-car lobby. Their answer to everything, economic growth, well being, etc., is centred around the ruddy car. e.g. they are going to close and sell a local leisure centre because there are facilities elsewhere in the district that people can get to by car. Unfortunately, long gone are the days when businesses had to apply to the council for permission to open a particular type of business in a particular location. If a business wants to open yet another pound shop in a street, there is precious little a council can do about it. Ironically, with respect to the needs of quiet streets, councils can still resist the opening of a restaurant or bar where there wasn’t one before. Great post, and a shrewd analysis of the situation. Hopefully you will submit it as part of the consultation. Had a close encounter of the HGV kind on East Street this afternoon. Me on a bike, him in his cab. Neither giving an inch. Was he unloading? Of course not, he was taking a short cut to get into the Carfax, preferring to follow the instructions of his satnav than actually read the road signs he passed. Still, at least he was polite, and admitted he was in the wrong when challenged. And I got a little cheer from some passers by. Thanks Greg. I will definitely be submitting a response to the consultation! Have you seen the 1960’s book “The Character of Towns” by Roy Worskett (1969) ? He used to live in Comptons Lane and was a significant influence in my becoming an architect/planner. Several illustrations (if I remember correctly) of West St with traffic. I used to live in Horsham until the mid 1970’s when I went off to university and never came back. Somewhere I’ve got some photos of the works creating the new ring road etc..- I’ll try and look them out as there are some good examples of anti-pedestrian pro-car signage…. I agree with your analysis of the reason for dead nightime streets.